When is the last time you attended a meeting or presentation that didn’t include some form of a PowerPoint presentation? Microsoft PowerPoint is the go-to source for business professionals, students, and professors who want the audience to benefit from an engaged presentation. Students – Ideally, students would learn Microsoft PowerPoint by the time they reached high school. In addition to creating impressive class presentations and reports, they will also have a skill they can take with them into the workplace. With the proper PowerPoint skills they can create compelling presentations that will help prepare them for life after school. Professors – There is nothing worse than speaking to a sea of glazed eyes. Today’s PowerPoint features ensure teachers and professors can create lectures that will keep students visually stimulated and engaged. PowerPoint can also be used to conduct learning assessments. 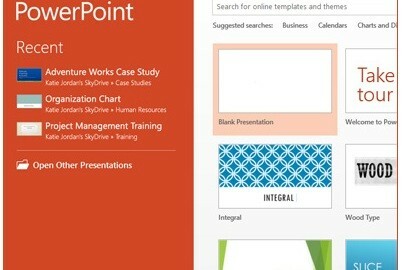 Professionals – Microsoft PowerPoint is used at all levels of business. From hiring and training sessions, to upper-management and shareholder meetings, high-quality, visual presentations are a wonderful way to get your message across to all audiences. In fact, many companies choose to pay for their employees to learn Microsoft PowerPoint in order to increase sales and customer/client confidence. Labyrinth Learning can help your organization gain the skills they need to get ahead with training software, learning materials and training courses to help you get ahead. Call our professionals today to learn more about how our PowerPoint learning materials can help you.